In 2012, Welsh director Gareth Evans and Indonesian martial artist Iko Uwais teamed up for their second film, a surprise international hit called The Raid: Redemption, known in the UK as The Raid. It starred Uwais as Rama, a rookie member of a SWAT team tasked with taking down a tower block run by a notorious drug dealer. Things go sour, and Rama wages an epic battle for survival. It was one of the ten best films I saw in 2012, and one of my favourite action films of all time. When they announced a sequel, my excitement was palpable. Originally just titled Berandal (Indonesian for “Thugs”), The Raid 2 is the film Evans and Uwais wanted to make in the first place. Budget limitations necessitated the scaled-down, claustrophobic setting of the tower block, but the success of The Raid has allowed them to expand, and make their gangland thriller. Picking up immediately after the original, Rama is picked up by a detective determined to bring down all of the corrupt cops in Jakarta. In order to do this, he plans to send Rama undercover in the city’s largest crime family, the Bangun’s, in order that he should witness Mr Bangun paying off high-ranking police officials. This involves Rama being sent to prison, where he does time with Bangun’s son, Uco. Uco is impatient and impetuous, and believes that his father’s brand of negotiation over bloodshed is weakening the family’s position in the criminal underworld. As my brother would have it, “That’s all well and good, but I’m here for the fights”. Not an unreasonable position. The fight choreography in The Raid is astonishing. It, and Evans and Uwais’ debut Merantau, make heavy use of the Indonesian martial art Pencak Silat, specifically the Silek Harimau style. It’s a style of fighting I was utterly unfamiliar with before seeing The Raid, but it is thrilling to watch. The speed, aggression and intensity are like nothing you’ve ever seen before. Though you would think the mundanity and repetitiveness of a tower block would limit what can be done, there’s a variety in the choreography that keeps it fresh and exciting. Berandal, however, has no such limitations, taking the fighting all over the city of Jakarta. This allows for complex, brutal fight sequences in locations as varied as a prison bathroom, a restaurant kitchen, a commuter train, the backseat of a speeding car, mid-chase no less, and a two-tiered night club to name but a few. It’s this sense of expansion and broadening of scope which, in my eyes, gives The Raid 2 the advantage over The Raid. Not just in its fight sequences, but in its plot, and in its characters. The first is a masterpiece in efficiency, with its linear structure, minimal dialogue, barely a handful of named characters, and a running time of just over 100 minutes. Here, Evans masters the sprawl; the locations are varied, he juggles multiple plot threads (to the point where there are a few extended sequences where Rama isn’t in the film at all, as opposed to his presence in at least 90% of the original), and it’s littered with memorable characters, from the aforementioned Bangun family, to the rival Japanese Goto family, loyal Bangun soldier Tosa, rising criminal presence Bejo, and his three chief killers, known only as Hammer Girl, Baseball Bat Man and The Assassin. At 150 minutes, the film seems to breeze by in the blinking of an eye. At the heart of the films is Iko Uwais as Rama. He’s the best thing to happen to martial arts cinema, in my opinion, since Tony Jaa first exploded onto the scene just over ten years ago with Ong-Bak. A former delivery driver who trained at the gym where Evans was filming a documentary on the Pencak Silat group of Indonesian martial arts, Uwais is a revelation in these films. There’s very little personality to Rama in the first, but Uwais’ intensity and presence are more than enough to carry us through. In the second, he’s required to do a lot more on the acting side, and he’s more than a match for the material. There are the standard tropes of the undercover cop story, sure, but his charm and presence are such that you can happily ignore the clichés. And the fighting he does is just incredible. He worked on a lot of the choreography himself, and some of the things he does as Rama don’t seem humanly possible. Uwais has the potential to be one of the great modern martial arts leads, although if Rama is the only character Western audiences ever see him play, that should be enough to seal his legendary status. The emergence of Gareth Evans is a fantastic story. A documentary maker who made his living teaching Welsh over the internet, he was hired to work on a documentary about an Indonesian martial art he’d never heard of. He fell in love with the style, he discovered Iko Uwais, and the rest is the making of modern action cinema history. He shoots the films extremely well, the editing and use of music adds to the excitement beautifully, and he gets the absolute maximum from his cast. In The Raid, he made a high-octane survival thriller. With The Raid 2, he has made a crime epic and modern classic. Whatever he makes next, I am there. The Raid 2 is a sensational piece of cinema, one of the best you will see all year. Oddly, its chief competition comes from a Welsh director named Gareth E., expanding from his small-scale, low-budget breakthrough to a more sprawling epic on a similar theme. Gareth Edwards’ Godzilla hits cinemas in May. 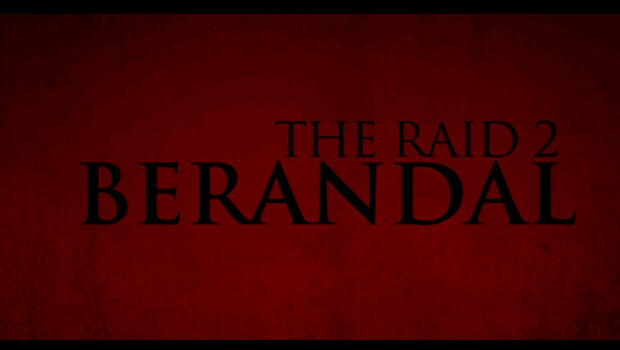 Gareth Evans’ The Raid 2 lands on the 11th of April. See it like your life depends on it. To date, it’s my favourite film of the year. Which, in the year of 12 Years a Slave, is testament both to the brilliance of The Raid 2 and the odd futility of comparing movies to each other. It’s an astonishing, breathtaking piece of work. Pay whatever you have to. See this in a cinema.